How can revolutionary organizations approach struggles in coherent and complimentary ways? The "sector strategy" may be a way of targeting a movement from multiple directions to see a vision through. For many in revolutionary and anti-authoritarian circles, discussions of strategy can be the sharpest of double-edged swords. While essential in so many ways, it can often become so removed from the actual work of on-the-ground organizing and becomes the realm of pseudo-academic double talk where things are analyzed, critiqued, and deconstructed to the point of useless introspection. As we are moving into a place of almost permanent austerity and economic crisis, some of the different areas of struggles are crystalizing in part because the represent very key aspects of working class life. Labor, housing, healthcare, environment, and other areas can be seen as specific “sectors” of struggle where by there are multiple possible approaches and specific targets from which you can work. As radicals enter into social struggle there has often been a trend to head towards either the “most radical” or the subcultural cliquish formation for whatever sector they are looking for. Labor has the IWW, housing has Take Back the Land, and environmentalism has Earth First! or some other similar movement. These have all served to be key outposts in each struggle that should not be discounted, but they certainly do not represent the entirety of the struggle. Revolutionary groups, from the anarchist platformist and especifist organizations like the burgeoning Black Rose Anarchist Federation, to cadre groups coming out of the collapse of Bring the Ruckus or the new Kasama Project, are often developing strategies internally that they then implement in the broader movement. The way that these political strategies are actually implemented is really decided by the ideological orientation of each organization, but they follow a predictable pattern of moving into larger “mass organizations” to do the actual work that matches ideological and revolutionary aims of the first organization. These mass organizations may not have an explicit political orientation, where by the revolutionary organization can make radical politics available and relevant to the struggles at hand. As these strategies play themselves out there has been a clash in many organizations as to where the energies should actually go. In an organization is to take on housing, should they move into an organization that already respects direct action and direct democracy like Take Back the Land or Occupy Our Homes? Would their time be better served by working with a larger non-profit or progressive group that has resources, and then focus on radicalizing it? There are merited arguments for both that are well treaded, but the real answer in this case is to find a place for both. In this way, organizations can look at specific sectors to organize in rather than organizations, and then find which organizations can fit complimentary “tent-poles” within that sector. This can take multiple forms, where by half the organization goes into a direct action oriented movement, while the other half moves into a local housing non-profit and focuses on pushing them in a more radical direction. If the organization is large enough, this could be broken up into three or four separate organizations, and could also mean developing an entirely new organization to meet the gaps where they are seen. A good way to determine how this will actually work will be to look at the sector specifically, what resources and histories you have in your given area, and the interest and capacity of the individual membership. If housing is the goal, you may want to choose between working specifically on home foreclosure cases or on tenant organizing. If tenant organizing is going to be the goal, then having part of the organization work with an Occupy Our Homes or Solidarity Network organization while some of the organization goes to a local non-profit to try to create a “tenant movement” to end “no cause eviction” that creates barriers to unionization. If your organization is large enough you can even go after both foreclosure and tenants issues simultaneously, finding ways to have two to three organizations work congruently under a broader housing strategy. These can be linked up by messaging around “housing as a human right,” creating broad moratoriums against mass eviction, or working towards neighborhood councils and tenants unions. Since all of these require long-term organizing and vision, the actual results will depend on what your organization intends to dedicate towards the movement. This idea was the cornerstone of the housing justice strategy taken on by Rochester Red and Black, which would later become a local of the Black Rose Anarchist Federation. Shortly after forming discussion began as to exactly where energies should be put. Locally, Take Back the Land Rochester had taken on several high profile eviction defense cases, as well as multiple housing liberations where houseless families were living. This was one of the most prominent movements in the area, and several members had participated in the past. Likewise, several members wanted to begin working with Metro Justice, and organization that has an almost fifty-year history in Rochester and has been the cornerstone of the progressive community. While in the past it had a decidedly liberal character, new leadership and campaign structures showed that it may be a place to push a more radical agenda on economic-issue campaigns. With a sizeable budget, staff time, and a great number of connections, there were plenty of resources to put to good use. The influence of an organized anarchist contingent would likely allow certain campaigns to take a sharp left turn and could push a more concrete agenda. As the debates continued about what campaigns to take on, the strengths and weaknesses of each organization became strong points of contention. Take Back the Land, while having a great bit of momentum, often times lacked stability and structure. Metro Justice had a long history and a deep well of resources, but was hardly the bastion of revolutionary politics. Each had elements that we wanted to isolate and support, but there was baggage to weigh through as well. A compromise was developed between people seeing that there was an opening in Metro Justice’s current Economic Justice campaign for a housing-specific committee. This would be new, yet in line with their current agenda, and members could have a great deal of influence in forming it and developing the long-term goals. The campaign then became “housing” more broadly, with some membership going into Take Back the Land and others forming the Metro Justice Housing Committee. The goal here became to use the structures of Metro Justice to support the direct action of Take Back the Land, hopefully allowing it to grow and become more stable. By association, Take Back the Land could use its implicit critique of capitalism and reliance on community direct action to push Metro Justice behind its perceived non-profit confines. The campaign inside Metro Justice became focused largely on a citywide moratorium on foreclosure-based evictions, which would directly support the actual organizing efforts in the neighborhoods by Take Back the Land. Later, Metro Justice would move in and directly support people resisting foreclosure as well, and City Hall was forced to deal with a growing housing campaign that was beginning to dominate the activist culture of the area. Here, we saw two tent poles, and we pushed the organizations in the direction of each other. The two organizations were chosen to match capacity, and a more full vision of housing could include other tenant organization, houseless rights groups, or various other projects. The effect that this has on a movement is obvious in that a coherent strategy allows the entire sector to see coordinated growth without different branches of a given movement competing. Instead of seeing the Metro Justice Housing Committee and Take Back the Land as groups that needed to compete for people and resources, they found ways of complimenting each other. This allowed each organization to do what they did best and to take the other pieces of movement building off of their plate, freeing them up to concentrate on specific tasks. The goal here is the larger movement of the given sector, which in this case was housing. What should not be ignored, however, is the effect this actually has on the revolutionary organization itself. When the membership dives headfirst into a specific sector of organizing this hast he effect of creating near experts in a sector, allowing them to become influential in the way the movement develops internationally. The intensive strategy around housing allowed many of us to know the world of housing struggles, eviction defense, foreclosure battles, and tenant organizing in a much deeper way, which allowed us to look at current tactics and movement coordination in a more educated light. In general, we concentrated our lived organizing experience in an area that also acted as a form of study. The group grew in that direction, and allowed us to bring a competent understanding of the movement into national gatherings and through propaganda. Likewise, by deciding to move into more than one organization we avoided many of the trappings that vanguardist groups like the International Social Organization get criticized for, where they move into leadership roles, overwhelm an organization, and take control of it. We consciously wanted to avoid this strategy, and instead put our energies where we already saw a trajectory that was complimentary to our larger political goals. We did not want to control the organizations, but instead help to build them and put our politics into practice. This is the most effective and stable form of recruiting since it is done honestly and openly, with demonstration of ideas put before mass membership. The effect this has on more liberal and reformist wings of the movement become really apparent in that the goals at play are put into a more transformative context. With the Metro Justice Housing Committee, the demands were carefully selected to play into a larger organizing context rather than just being ends in and of themselves. While the Chase divestment campaign had been a hallmark of liberal organizing, and it would be a positive development on its own, one of its main purposes is to simply tie into the larger housing justice movement and to create momentum. The second, and more involved, demand was for the city’s moratorium on police participation in foreclosure-based evictions. This would allow for neighborhood-based direct action organization, such as Take Back the Land, a huge boost to organize without interference of forced evictions. Hopefully, when the moratorium ran out, there would then be organized community forces ready to defend the communities. The endgame here is to create a space for direct organizing rather than just wining electoral gains, and we should continue to see how the liberal campaigns that already exist could be used in a revolutionary context. The application of a strategy like this really depends on what kind of actions are in a given area. The choice towards housing in Rochester was originally suggested both because of the unique level of foreclosures in the area as well as the existence of Take Back the Land, which already rested on direct action principles and had momentum behind it at the time. In different areas the same could be said of environmental struggles, healthcare, immigration issues, and dozens of other possibilities. 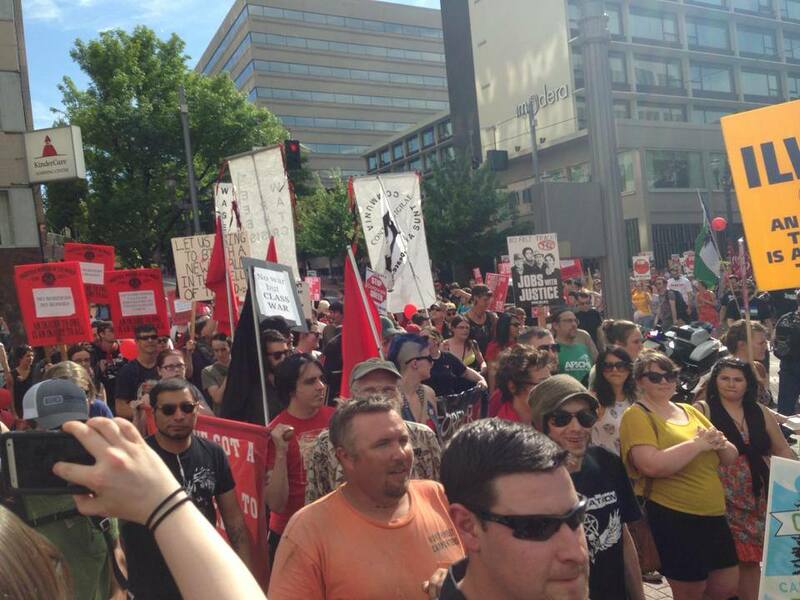 The inclination for many “class struggle” anarchist organizations is towards participating in labor struggles because of their strong syndicalist traditions, yet if people are thinking in this “sector strategy” it may make sense to try and create a more focused subset than simply participating in Big Labor organizing projects or parallel organizing strategies with organizations like the IWW. With Big Labor, staff still drives decision making, which make it difficult for the members of the organization to have a detailed say. What could make sense is to instead have a very focused and specific goal within labor broadly, such as fast-food workers or day laborers. In this way you could pair wage-theft campaigns with organizing projects such as Solidarity Networks with existing non-profits or unions. The real heart of this strategy is to see a particular area to some type of “tipping point,” making it reach that point when it breaks from the current arrangements. With housing as an example, this idea would be to see working-class organizations become a primary “problem solving” organization in a particular area, taking on issues from organization to eviction defense. Neighborhood assemblies, tenant unions, and other similar formations reaching the point at which they have primary control over the areas is a point of dual-power where by the new directly democratic institutions eclipse those anti-egalitarian ones offered by capitalism and the state. It is at these points that a crack is formed in the financial matrix that makes up commercial housing, and at which we can exploit to force in revolutionary projects across all the sectors that compose daily life. The strategy has at its core the promise that to undermine the control of the ruling class in a particular sector that you begin a revolutionary process that challenges the system as a whole. Many people have ideological preferences towards a particular sector because of its perceived primacy in the system (usually labor), but the reality is that capitalism requires commodification and inequality in all the various structures that make up the different areas of social life. From housing as a form of commodity, to interpersonal hierarchies such as heteronormativity and patriarchy, the system needs to maintain this stratification if it is to allow itself to continue. Finding points of confrontation and, finally, rupture, allows us the breaks we need to push through a radically different vision of society. In one town an organization may go after housing as a sector, while others may see other institutions as especially vulnerable. It is when we go after these different areas simultaneously and with a complementary revolutionary vision that we actually have the possibility to light a fire. Developing a coherent strategy that knows how to develop goals and assess results is an important component of creating revolutionary organizations that work within mass movements. Making choices about what to participate in, what to create from scratch, and what movements have the ability to act as a piece of a revolutionary strategy are things that should come out of extensive conversations within organizations as they develop a vision for the world that could be. This organizing strategy is not set in stone and should be played with, altered, modified, and even tossed as organizations create more involved politics that can help them bridge the struggles of today and the prefigured visions for the future. Think about how this can help you engage in direct action campaigns and to create a fighting force within a particular sector, which is a critical stage if we are ever going to develop a significant challenge to the current order. What could make sense is to instead have a very focused and specific goal within labor broadly, such as fast-food workers or day laborers. In this way you could pair wage-theft campaigns with organizing projects such as Solidarity Networks with existing non-profits or unions. Are you saying you could have a broad strategy across labor groups, i.e. try to get business unions, NGOs, IWW, solnets, etc to all work towards a similar campaign? Or something else? No, I actually think that labor would be a really difficult sector for this in general. Instead, I would say that it would be best to be very specific. For example, if wage-theft was a focus, here in Portland we could focus both on the Portland Solidarity Network and the VOZ Workers Center, that works with Latino day laborers(which is what we currently do). Then the focus could be isolated on low-wage/precarious work, and then a more long-term vision for that particular sector could be envisioned knowing that your two tent poles are the SolNet at the workers center. I avoided going into too much deal in regards to labor because it is more broad and has more institutional centers(Big Labor) than does, say, a housing justice movement, which may have a couple non-profits working on it, but doesn't have anything comparable to SEIU. Basically it makes it easier to enact this strategy with something like housing justice, or if you are going to choose labor then to try something very narrowly focused. I also want to note that this is a seed idea that I think would be very flexible to different organizations, but I wanted to put it down because it is at the heart of many of the visions I have when working in revolutionary organizations.